• Roulette Royale jackpot pays out fifteen dollars when you get the same amount X2 in a row. • Roulette Royale jackpot pays out two hundred dollars for getting the same amount X3 times in a row. • Roulette Royale jackpot pays out three thousand dollars for getting the same amount X4 times in a row. 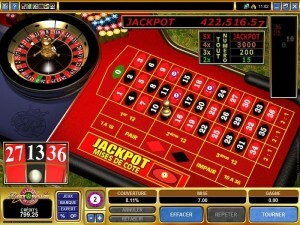 • And, of course, the Roulette Royale jackpot pays out the big jackpot amount for getting the same amount X5 in a row. This is one of the most exciting Roulette Games around not only because of the exciting Jackpot feature but it has a wonderful playing experience. The interface is easy to use and allows the player to have complete customized control over the game. They can change the speed, adjust the volume settings and have complete control over the betting. It is suitable for all players alike and can be picked up quickly and easily. The betting options are varied and you can try the even-money bets: red or black, high or low, odd or even etc. The row and column bets are also popular. As far as strategy goes, some people prefer to play as if the Progressive Jackpot doesn’t exist and rather treat it as a nice little bonus instead if they hit it. The presence of the Jackpot brings an element of unpredictability into the game but it’s also very fun an exciting.